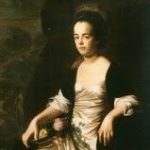 Nancy was an attractive and lively young woman, who at the age of 16 already had several suitors, among them Richard Randolph’s younger brother, Theodorick. Many years later Nancy would claim that she had been engaged to marry Theodorick, but no announcement was ever made, and in February 1792 Theodorick died after a long illness. 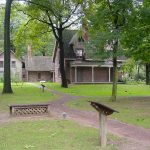 On October 1, 1792, Richard Randolph, his wife and Nancy arrived at the home of a cousin, Randolph Harrison and his wife Mary, on their estate at Glenlyvar in Cumberland County, Virginia. During the night, the Harrisons were awakened by screams coming from Nancy’s bedroom, which was above theirs, and then a servant came to say that Nancy was sick and to asked Mrs. Harrison to take up some laudanum. When Mary Harrison went upstairs she had to go through Richard and Judith’s bedroom to get to the room occupied by Nancy. Judith Randolph was sitting up in bed but Richard was in Nancy’s room, and he had to open the door, which was bolted from the inside. Mary Harrison was not allowed to take a candle into the room, but stayed a few minutes with Nancy before returning to her own room. Later that night the Harrisons heard footsteps, which they believed to be Richard’s, going down the stairs and then returning. 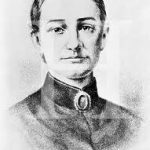 Within a short time rumors, apparently originating among the slaves of the Harrison household, began to circulate around southern Virginia that Nancy Randolph had given birth during the night of October 1, the baby being the result of an adulterous affair with her sister’s husband, Richard Randolph. The baby had been killed and its body disposed of. One of the Harrison slaves took Randolph Harrison to a pile of old shingles and there Harrison saw bloodstains; the slave claimed that this was where the body had been left. But no body was ever found. As the stories spread and were embellished, the honor and reputation of the Randolph family became an issue. In January 1793 Richard Randolph sought the advice of his stepfather, Henry St. George Tucker, a judge and law professor at the College of William and Mary. His initial advice was to do nothing; these were scurrilous tales spread among the lower classes and should not be dignified with a response. They would soon fade away. The Randolphs spent two months in Williamsburg, making a show of familial bliss from the urban stage of the former capital, but failed to staunch the flow of gossip. It soon became apparent to Richard that he was suspected by members of the gentry class of committing adultery with Nancy and murdering the child he had fathered by her. As his counsel, Richard Randolph retained John Marshall, who was destined to become the most celebrated chief justice of the U.S. Supreme Court. Marshall was a distant relative of the Randolphs and a close friend of St. George Tucker. It was also decided to enlist the help of Patrick Henry, who had become a kind of living legend. As an attorney, Henry was known for his skill in cross-examining witnesses. Marshall already had a reputation for his ability to analyze evidence and to present logical arguments for whatever position he was defending. There are no official records of the trial; the proceedings have been reconstructed from notes in the papers of John Marshall. The trial was held before a panel of 16 ‘gentlemen justices,’ but not all necessarily sympathetic to the Randolphs – among them were members of other prominent Virginia families with whom the Randolphs had long-standing feuds. Under Virginia law Richard and Nancy Randolph could not be required to testify, nor could slaves appear as witnesses, although Mary Harrison had seen two young female slaves in Nancy’s bedroom when she had taken in the laudanum. Randolph and Mary Harrison testified to their involvement on the night of October 1 and the events they were aware of. But under cross-examination by Patrick Henry, Randolph Harrison testified that he had not entertained ‘any suspicion of criminal correspondence’ between his guests. Mary Harrison told the court that she had no suspicions of Nancy until after she heard the rumors, and even then she considered the probability of a birth or miscarriage having occurred to be low. John Marshall delivered the closing statement for the defense; he did not attempt to dispute any of the facts presented by the witnesses. He pointed out that there had been no proof that a baby had been born that night, much less that it had been killed. All of the other circumstances were open to an innocent interpretation. If relatives had observed expressions of fondness between Richard and Nancy, was this not quite natural? She was his wife’s sister, she had been obliged to leave her own home and her suitor, Theodorick, had died. Marshall concluded that although ‘the friends of Miss Randolph cannot deny that there is some foundation on which suspicion may build,’ at the same time her enemies could not deny that ‘every circumstance may be accounted for, without imputing guilt to her. In this situation candor will not condemn or exclude from society a person who may be only unfortunate.’ The justices accepted this argument. There was insufficient evidence for a conviction and the pair were freed. The incident became known as the Bizarre Scandal and though Richard was acquitted of the crime in court but spent the rest of his life in the shadow of the scandal, which haunted the family for generations. Three years later Richard Randolph was suddenly taken ill with a high fever and died. Nancy remained at Bizarre after her brother-in-law’s death in 1796, but was asked to leave in 1805. 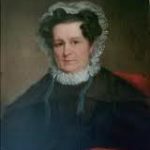 She returned to her father’s home at Tuckahoe briefly, stayed with friends in the vicinity, visited for extended periods at Monticello – where her brother Thomas Mann Randolph and her sister-in-law Martha Jefferson Randolph lived – and then moved on to Richmond. Nancy found it difficult to live there on her limited means, however, so she traveled north to Rhode Island and then to Connecticut in hopes of improving her circumstances. She had known prominent New York statesman Gouverneur Morris for years, and in April 1809 agreed to work as his housekeeper at Morrisania, his home in New York City. Gouverneur Morris was bom at Morrisania on January 30, 1752, and graduated from King’s College in 1760 at the age of sixteen. He studied law and became one of the ablest and most brilliant lawyers in America. 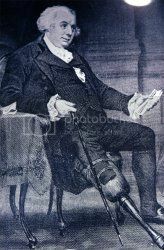 When Morris was only 28 years old, he was involved in a carriage accident, and one of his legs was smashed by the carriage wheel and had to be amputated below the knee. On Christmas day in 1809 Gouverneur Morris shocked the family members he had invited to Christmas dinner by having a clergyman present and marrying Nancy on the spot. At 57 years of age, he was more than twenty years her senior. It was a happy marriage and their son Gouverneur Morris Jr. was born in 1813. Richard and and Theodorick’s younger brother, the powerful politician John Randolph, after a distinguished political career became embittered. Convinced Nancy had poisoned his beloved brother Richard, John Randolph chose to revive the old accusations against Nancy in a letter in 1814. In a reply that she circulated among John Randolph’s political enemies, Nancy Randolph Morris wrote that she had indeed given birth that October night in 1792 at Glenlyvar, but the baby had not been killed; it was born dead. The father, she said, was not Richard, but Theodorick, whom she had intended to marry. The baby had been conceived, she indicated, just a few days before Theodorick’s death. Her claim, however, has not been universally accepted as true. Morris spent the last years of his life at Morrisania, continued to speak out against the Democratic-Republicans and violently opposed the War of 1812. In the years 1810-13 he served as chairman of the Erie Canal Commission. Gouverneur Morris died at Morrisania on November 6, 1816, at the age of 64, and was interred in St. Anne’s Episcopal Church Yard in the Bronx, New York. Nancy remained at Morrisania, taking care of their son. 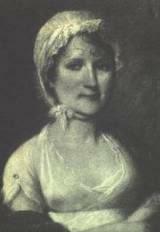 Ann Cary Randolph Morris died at New York on May 28, 1837, at the age of 62‎.